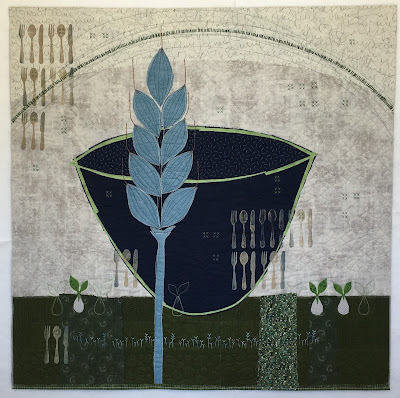 Deborah's Journal: Another Bowl Quilt! I am thrilled to share my newest art quilt, Provisions. I'm also thrilled to say it's been juried into the Dinner at Eight special Exhibition: Patterns. It will premier at International Quilt Festival in Houston in October. It's 40x40. Here a short statement about the patterns I was thinking of when I created it. People create consistent patterns of seeking and finding nourishment. We need to provide for physical, emotional and creative sustenance. 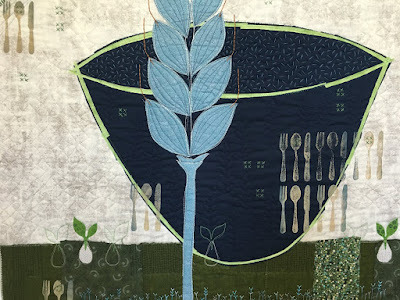 Sometimes a seed grows into a plant and makes its way to the dinner table. Sometimes a seed grows into an idea that cultivates inspiration. I'm continuing with the bowl thing. 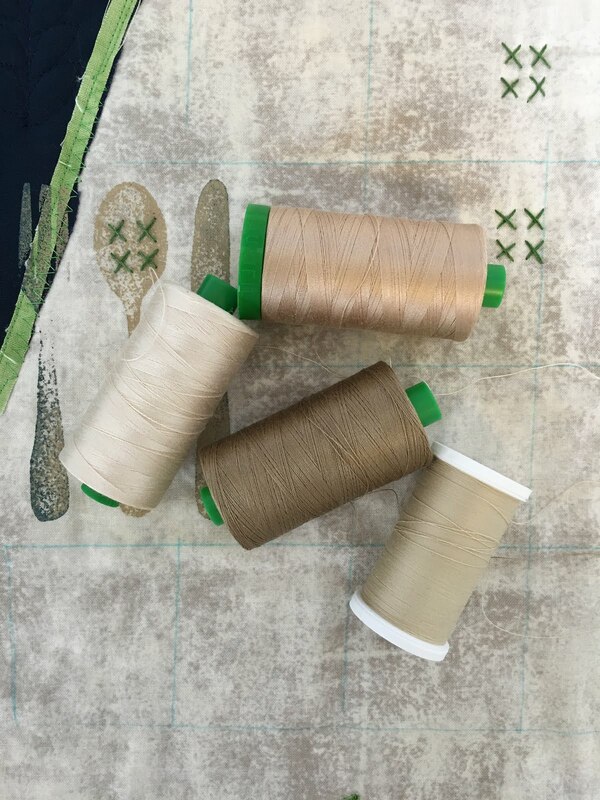 And always exploring new ways to layer fabric, paint and stitch. 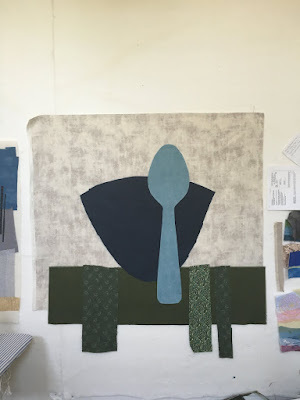 Here's an early in-progress shot where I was considering including a giant spoon. Thankfully, I realized that was a terrible idea. Another in progress shot where the major elements are just being refined. Here I've added the small sprouts along the "horizon" line. 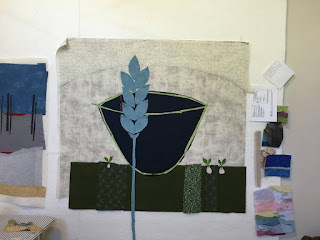 And the stem of the wheat. 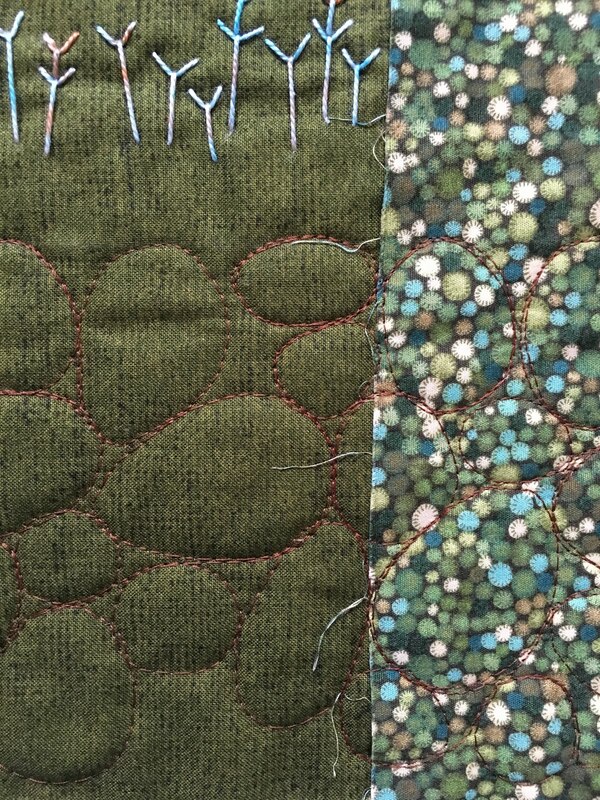 At this point, I'm envisioning what it needs with surface design and stitching. I made a foam stamp with this fork, spoon and knife imagery and used a bit of tan and navy paint to make the prints. I machine stitched stones into the ground sections. I hand stitched my beloved Ys. 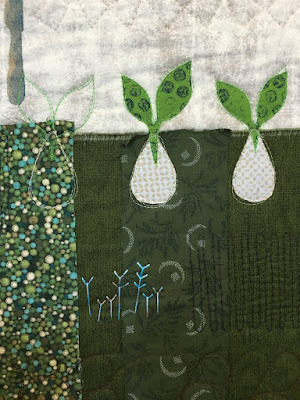 Plus machine stitched outlines of the sprouts, both the fabric sprouts and some with just the machine stitched outline. 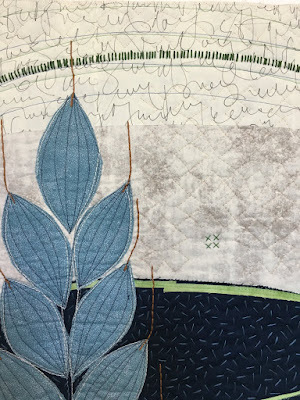 I had a tough time deciding how to quilt the background and what color thread to use. I ended up stitching a grid-like pattern inspired by the cross stitches. You may be able to see the faint blue marked lines above. I used those as a general guide. You can see the subtle motif here. 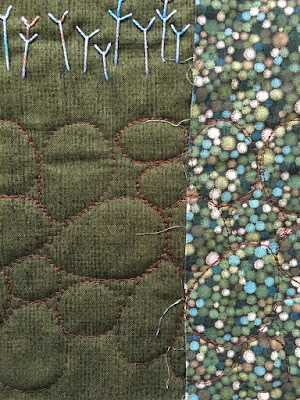 The idea of free motion stitching a motif within a marked grid is a new technique for me. I like it! I'll definitely do that again. 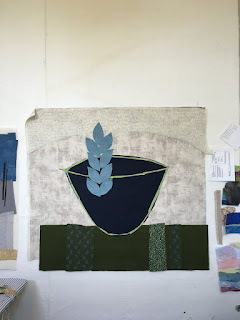 I toyed with the idea of titling this piece Need Seed Feed. I like the simplicity of the rhyme and symbolism. But, I just never really warmed up to it. Then I spent lots of time jumping from one word to another on an online thesaurus and ended up with Provisions, which actually has many slight variations in definition. 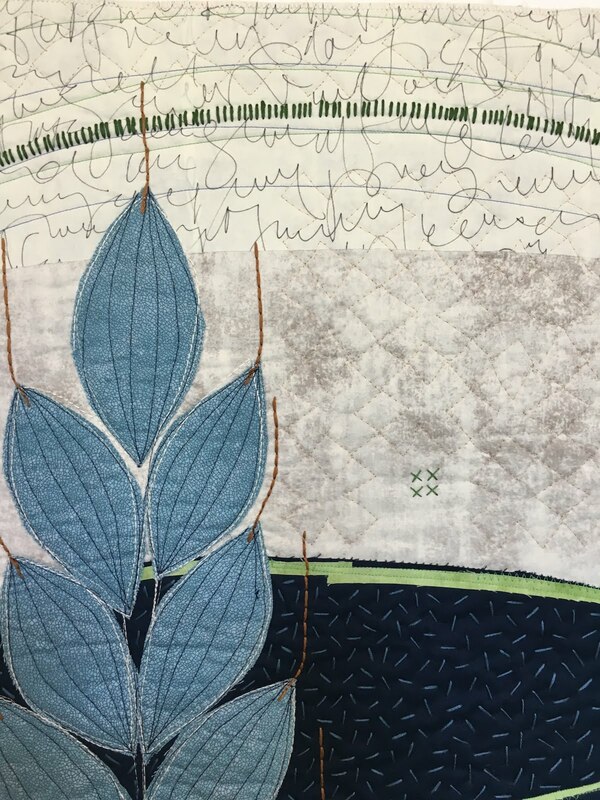 I like the sound of it and I hope viewers see the quilt and the title and make their own connections. being a gardener I love the sprouts, the full grown plant. Are there any seeds? Most of all--as a person who has strayed for years from any art making--I love seeing how the process began then changed and matured. So your "seed" has been sown and I am looking forward to making a bowl quilt for the 10 by 10 art auction. Thank you dear friend-always-- for leading the way!!! Thank you for sharing your thoughts and process on making "Provisions." Your quilt is marvelous in every way. Thank you for sharing your process for this piece and the stitching you used. Excellent titile choice for a wonderful piece. Another wonderful bowl piece, Deb! I loved seeing a bit of your process too, thanks! 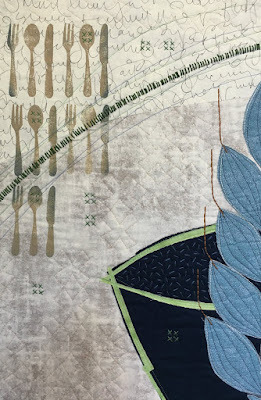 Really like your article in Quilting Arts! very well written and I learned a lot too. I read thru your journal email and went to your site to leave a comment and see you added more photos now I want to go back and look at all the photos I missed getting to the comments page. Keep making quilts. I do abstract and know what you mean about the realistic ones.